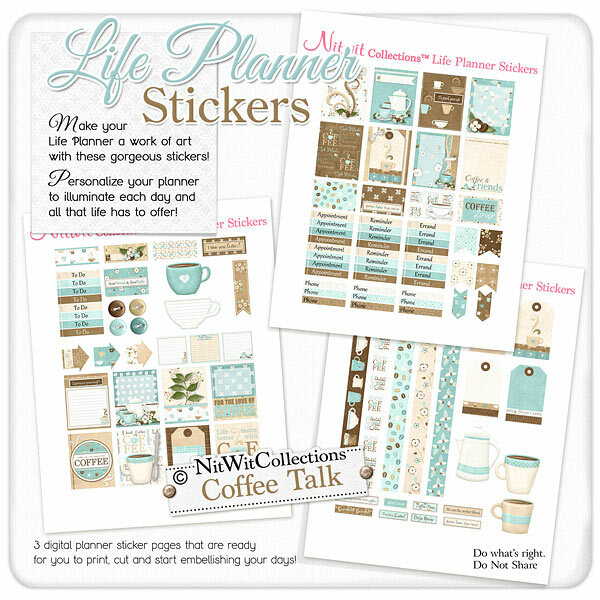 "Coffee Talk" Life Planner Stickers are more than just a cup of our morning ritual, it's about what it represents. We share a cup with a friend, maybe a quiet peaceful moment to just think, or even a lively evening with friends. Coffee is more than the energy that the caffeine gives us, it is about the times we spend while enjoying it. What will you do with your coffee inspiration....cream and sugar or just black! 16 - 1.5" x 1.9" full boxes to "Perk Up" your planner boxes! 4 - 1.5" wide box strips. Use these as top strips on your day boxes or wherever you see them in your planner pages! 3 - Arrow elements....we all need reminders and these digital elements will do just that! 3 - Square elements with lines on each for you to write in notes, lists, etc. 1 - Coffee cup filled with coffee....a sight for sore eyes for us coffee lovers!! 4 - Tag elements in a rectangular form. Each differently adorned and even space to write on these. Would these be the right element for a cover, side journal area or just decor?! 1 - Coffee Pot element...please affix this in the upright position so as not to spill any! 8 - Word tags for you to place in wherever you see fit. The sentiments mirror the theme of this digital planner sticker kit....now where's the perfect spot?